BRITISH beat poet and jazz troubadour Michael Horovitz brings a cornucopia of the Counterculture to the Southbank’s Festival of the World this June with his Countercultural Olympiad: P O E M! 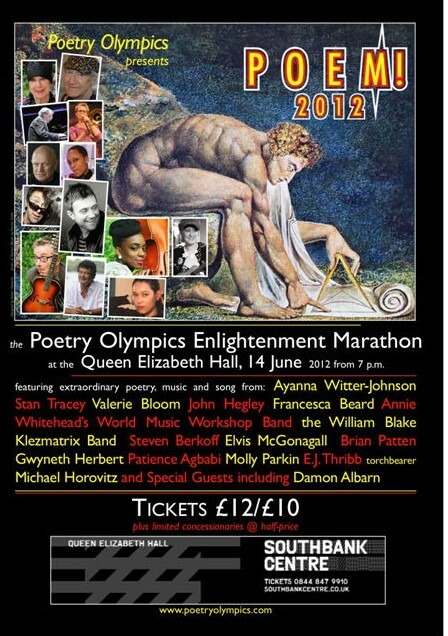 2012 – the Poetry Olympics Enlightenment Marathon festival. On 14 June the Southbank Centre’s Queen Elizabeth Hall will be playing host to a mix of several generations of transmedial superstars, many of them first helped to the fore via Horovitz’s New Departures/Poetry Olympics bandwagons. Poets and musicians performing include: Damon Albarn, Ayanna Witter-Johnson, Stan Tracey, Gwyneth Herbert, Brian Patten, Molly Parkin, John Hegley, Annie Whitehead and Steven Berkoff. Since 1959, Horovitz has brought together poets, artists, musicians, playwrights and performers from all walks of life, working towards a vision of a United Arts of Britain. From the 1965 sell-out Wholly Communion International Poetry Incarnation at the Albert Hall, which still holds the record for the biggest audience for a single poetry event in Europe and kick-started the UK countercultural revolution, to Children of Albion, the Penguin anthology of Poetry of the Underground he edited in 1969, to the 1980 Westminster Abbey Poetry Olympics and beyond, Horovitz has promoted some of the best and brightest in Britain and the world. Why a Countercultural Olympiad? Poetry Olympics was founded in 1980 in a very public response to Margaret Thatcher’s attempt to prohibit athletes from competing in the Moscow Olympics. Horovitz invited an international selection of poets, including Americans and Russians, to perform at Westminster Abbey in protest at the West’s uncivil Cold War political posturing. Horovitz has been staging a multifarious array of activities ever since, both cultural and Olympian, grown from the grass roots up. He has always delighted in celebrating excellence and multiculturalism; P O E M! 2012’s Countercultural Olympiad is no exception. “Appropriately for the 32nd anniversary of the founding of Poetry Olympics in the run up to the 1980 Olympics, the line-up for this Countercultural Olympiad is a cross-section of some of the most inventive, energetic, versatile and communicative poets and musicians I’ve worked with over the years,” says Horovitz. “‘A perfect iPod playlist,’ says my son. If he means compilation album then I agree, given that P O E M! 2012 includes jazz innovator supreme Stan Tracey; scintillating 21st Century songbirds Ayanna Witter-Johnson and Gwyneth Herbert; new Elizabethan Renaissance maestro Damon Albarn; Annie Whitehead’s 38-piece World Music Workshop band making whoopee; performance poetry pacesetters Patience Agbabi, Valerie Bloom, John Hegley, Elvis McGonagall and Brian Patten – plus Steven Berkoff’s hitherto unsung bardic frenzies; my anglo-saxophone alongside ebullient fellow Wm Blake Klezmatricians Annie Whitehead and Peter Lemer; Molly Parkin projecting her purple passages more flamboyantly than ever at 80; and not forgetting the devastating understatements of Private Eye’s perennnial teenage elegist E J Thribb. P O E M! 2012 takes place at the Southbank Centre’s Queen Elizabeth Hall on Thursday 14th June from 7pm. This entry was posted on 7 June, 2012 in homepage, Uncategorized and tagged Michael Horovitz, poem, Poetry Olympics, South Bank Centre. Bookmark the permalink.